Many anglers struggle with techniques, fly casting, presentation or distance etc. for little or no reason, just failure to get good quality fly casting instruction. They possess the equipment, they have the physique, they have almost everything, except that little guidance or tuition from a fly fishing instructor that will mould the parts together and make fly fishing easy. As a professional fly fishing instructor it is my job to diagnose problems and cure them. An experienced eye can spot the causes quickly and very soon you will have an understanding of the technique and also the cure. It is truly amazing to see the benefits from a couple of hours of fly fishing tuition and it gives me tremendous satisfaction to know that people are going to enjoy fishing much more. Advanced Professional Game Angling Instructors (APGAI) are possibly the most experienced and best qualified fishing instructors available anywhere. Alastair Gowans APGAI is a game angling instructor in all disciplines, trout fishing (single handed casting), salmon fishing (double handed casting) and fly tying. 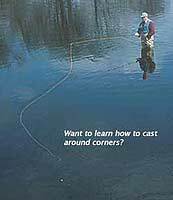 Instruction is available on all aspects of fly fishing, salmon or trout fishing. Casting problems are a common reason for seeking advice and I teach a wide range of single and double handed methods and in a variety of styles. The most popular topics are fly fishing for beginners, Spey casting, Underhand casting, Single handed Spey cast and double haul. The beauty and practicality of presentation casts for dry fly fishing, curved casts, air mends, slack line casts, parachute casts etc. are widely appreciated and often requested topics. If you wish to book for tuition, need a fly fishing guide or outfitter in Scotland or want contact me, Ally Gowans for advice please do not hesitate. Groups of up to 6 friends can be taken together. It is not a problem for me if they each have their own agenda. I can cope! Tackle is available for use during instruction and if you would like to test a rod from one of the local shops that can be easily accommodated. Children under 14 years of age are given free tuition only if they are accompanied by a fee paying responsible adult (two children maximum per adult). Fishing tackle may also be hired by the day locally at modest rates. Telephone/answering machine number for bookings is +44 (0) 1796 473718. Angling Clubs, Fishing Tackle Retailers and Corporate Events - please contact me for special group rates.